Appearance: orange in color with a 1/2" head. Smell: rosemary and some earthiness is detectable. Taste: caramel,, orange, grapefruit, rosemary, and a piney bitterness. Mouthfeel: medium bodied beer. Crisp from start to finish. Some dryness arrives late. Long lasting rosemary flavors. Overall: the rosemary was different but by the end of the bottle I was tired of it. Not a bad beer in small doses. if you saw the movie (spoiler 30 years after alert!) Rosemary's baby was the spawn of satan.. I'm not saying this is beelzebub jr... but it ain't manna from heaven. Stick to their wild rice DIPA, that one hits the mark. A - Nice bright and clear medium gold color with a really thick, white frothy/creamy head. Lacing is sticky on the glass like cotton candy. S - Nose is pretty faint. Some earthiness, a little bit of pine, and light melon. I really have to dig to even find much aroma out of this. T - Pine resin, rosemary , spiciness, and some toffee malt buried way down there. Finishes with a lingering piney bite. Very slight alcohol warming on the way down for a 9% beer. M - Big medium body that's borderline full bodied, smooth texture with light carbonation. O - Interesting, different, unique, and worth a try. ...except that those were nowhere to be found. Plenty of bread and thyme-like spice where found here which served as a moderate saving grace to this brew. It was a bit thick and sticky in the aftertaste as some lingering caramel could be discerned, but the flavor never really won me over. Thankfully, the alcohol wasn't *that* strong and wasn't a deterrent. 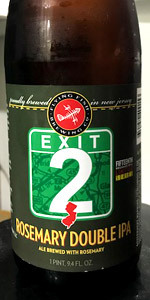 Out of all the Exit beers that I had from Flying Fish, this was probably the one I rated the lowest. It's not a drain pour but it needs to go back to the drawing board - er, fermenting tanks for a second try. This needs and deserves improvement. Undated 25 oz. bottle. Poured into Belgian ale glass. L: 2F head with decent retention, leaves lots of sticky lacing and a cap and ring. Beer is a clear amber with visible carbonation bubbles. T: I'm rarely inclined to say "ingredient X doesn't belong in beer." More than once, I have been proven wrong when I have it in mind. That said, if rosemary belongs in beer, it doesn't belong in this one. It dominates the front end of the flavor and clashes with the sweet malts and even with the earthiness and pineyness of the back end. This is not good drinks. I've never handed out a lower score for taste. And I like rosemary, in general. F: Light to medium body, medium (pretty lively) carbonation. Construction and balance are what they are; the rosemary just knocks everything way out of whack. Drying is good, some earthiness on the finish. O: I really hate to knock Flying Fish as a homestate brewer and I have enjoyed many of the Exit series offerings. On the good side, the Oyster Stout is no longer the worst one! LOOK: Clear, golden, medium white head. Fades completely after a while. AROMA: Pine, wood. Par for a resinous IPA; though I do not get the Rosemary much. It's there, but faint compared to the pine. TASTE: bitter sap/resin, a touch of the Rosemary or other herbal earthiness but again not enough to warrant the word "Rosemary" in the name. FEEL: Mid to Full Body. A touch sticky. below average on the carbonation for the style. Interesting, but not good. Disappointed in the lack of Rosemary. Very surprised by this rosemary beer, very refreshing and flavorful. I'd you don't like rosemary....still try it!